Mid-Century Modern has been the darling of the design world for some time now, but wood grain and tapered legs aren’t the only game in retro town—especially in the kitchen, where well-placed throwbacks from any decade are often right at home. Plenty of homeowners are infusing their cooking and dining spaces with other old-school design staples, rethinking everything from size to palette. Whether in a nod to the bold approach of the ’30s or the kitschy flourishes in ’60s design, modern kitchens are finding a fresh new face in the past. 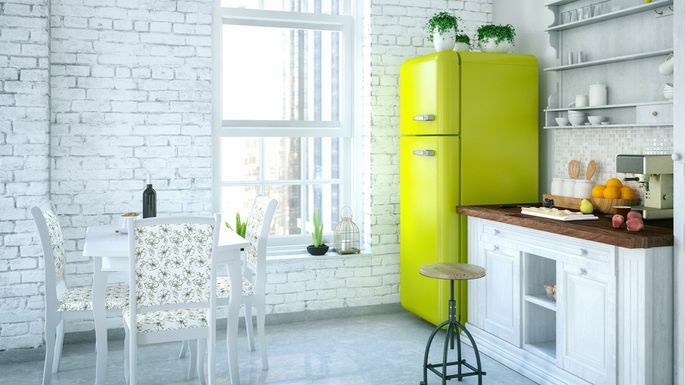 These seven kitchen trends are all about the retro style. The etymology of the phrase “everything but the kitchen sink” probably has to do with the fact that the sink is difficult to move. For instance, if a person absconded with “everything but the kitchen sink,” it means he or she made off with every conceivable portable item. But here is a new way of looking at the term: What if said person didn’t take the hypothetical sink because it was too necessary to the kitchen?